Revellers stay warm before the 92nd annual Macy's Thanksgiving Day Parade in New York, Nov. 22, 2018. Diana Ross might be singing "Stop! 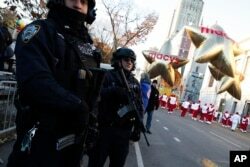 In The Name of Gloves" by the time she's done performing at New York City's super chilly Macy's Thanksgiving Day Parade, which forecasters say could be the coldest ever. John Legend, Martina McBride and the Muppets from "Sesame Street" are also slated to perform in the frigid cold. Windy conditions are also expected and officials will be monitoring wind to see if giant character balloons such as SpongeBob and Charlie Brown can fly safely. 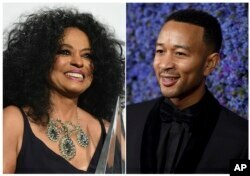 Diana Ross and John Legend will be among the stars celebrating at Macy's Thanksgiving Day Parade in New York City on Nov. 22. Police say they're ready to order the 16 helium-filled balloons to a lower altitude or removed entirely if sustained winds exceed 23 mph (37 kph) and gusts exceed 34 mph (54.7 kph). There have been mishaps and injuries in the past when gusts blew them off course. The National Weather Service is projecting temperatures in the low 20s (-3.9 to -6.7 Celsius) and sustained winds of up to 20 mph (32.2 kph) with gusts to 30 mph (48.3 kph), just inside the safe zone for the balloons to fly. 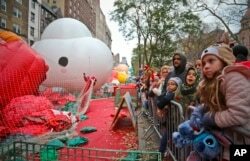 Crowds gather to see giant character balloons being inflated the night before their appearance in the 92nd Macy's Thanksgiving Day parade, Nov. 21, 2018, in New York. Thursday has the potential to be New York City's coldest Thanksgiving since 1901, when the temperature only got as high as 26 degrees (-3.33 Celsius). The coldest on record was in 1871, when the warmest it got was 22 degrees (-5.5 Celsius). Members of the New York Police Department take a position along the route before the start of the 92nd annual Macy's Thanksgiving Day Parade in New York, Nov. 22, 2018.